Once I went to a show and it was called Wizard of Oz. It took place in Kansas and Oz. And Munchkinland. So, there was a kind of tornado; it was a little bit scary. They just put a screen around the house that went around in a circle. I liked the dog who played Toto. He was really good and so was the girl who played Dorothy. And Aunt Em. I thought they were good because they had so much excitement. And they sang a pretty song called "Over the Rainbow." She was a little girl, but she was not actually a little girl; she was a grown woman. There were still some kids in the show that played the munchkins. 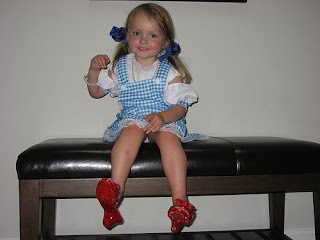 One of the munchkin girls should play Dorothy. And I think Toto was just fine the way he was, but I think it would be very exciting if Dorothy carried Toto in the basket for awhile until they got to the Oz. Instead he walked along behind. I thought the costumes were pretty. Dorothy's costume was very beautiful. It was black and white at the beginning. That made it different. It was blue and white in the rest of the show. The costume of the scarecrow I liked because I liked how his costume was kind of blue. I liked the Tin Man's costume because it was one of my favorite colors: silver. It looked very hard to dance in; the metal looked like it was really hard. I liked the Lion's costume. It kind of looked like a real lion—but a cowardly one. It looked cowardly because Yellow is a kind of cowardly color. The singing and dancing was very pretty. It made me and Annika dance along. Annika is one of my friends, does anybody remember her? She gave me the Sushi Pack because she is one of my good friends. "Somewhere Over the Rainbow" was my favorite song. "If I Only Had a Brain" was one of my favorite songs. There were crows. The crows didn't like the scarecrow very much. They sang nice and beautifully. Jitterbug was one of the songs that was not in the movie. Because it was a good dance they put it in the show. I liked when she went home. I want other people to go see it--all my friends.